Accommodation at the Dower House may be either self-catering or bed and breakfast with all the four separate apartments available on this basis. Apartments have either one or two bedrooms, lounge/dining room a kitchen and a bathroom with both shower and bath. 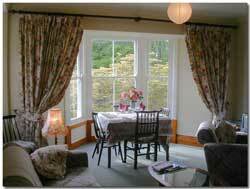 All are comfortably furnished and fully equipped for your stay whichever tariff you choose. For self-catering guests the kitchens are fully fitted with an electric cooker, fridge/freezer (freezer compartment in Orchard Corner), electric kettle and toaster, and ample food storage space. 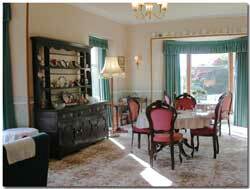 Bed and breakfast guests have full tea and coffee-making facilities and use of the fridge. Use of the full kitchen facilities may be arranged for a small extra charge. All the apartments have colour TV, radio and coal-effect electric fires. Cots and high chairs are available by prior arrangement. 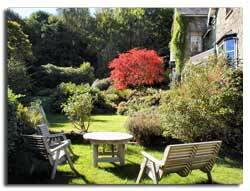 The gardens and grounds are for the use of guests and we have a games room with pool, darts and table tennis. Access to the apartments is through the grand main hall which contains a superb fireplace with carved wood surround. Off the hall is a large, comfortable Residents' Lounge/Dining room with wood-burning stove which overlooks the lawn and water garden. There is ample parking space for guests’ cars at the top of our long, secluded driveway. Each Apartment is individually designed to provide spacious and comfortable accommodation for our guests and to take advantage of the fine views of the gardens and surrounding countryside. Situated on the first floor, this cosy apartment has a double bedroom, lounge/dining room with kitchen area divided by a breakfast bar. There are lovely views of the magnificent acers and other trees. Approached by a balustrade staircase, this first-floor apartment comprises a spacious lounge/dining room, with lovely views over the gardens and hills beyond. 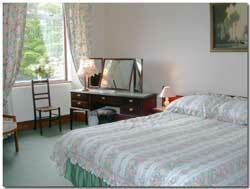 The large double bedroom also has a single bed. This comprises a wing of the house on the second floor, with far-reaching views. There is a comfortable lounge/dining room and separate kitchen. One bedroom has 2 single beds and the second has a double bed.